Please correct me if I’m overlooking this feature already. I’m picturing a “hide others”/“show all” system. It doesn’t work in my taskpaper 3.3. Does the script need to be updated or other reasons? Thanks – there are a couple of API details which changed after that script was written. It could now, I think, be written something like the redraft below. It’s great! Thank you for your work. There’s a little different from the display of select the project by pressing cmd + L: it doesn’t show the parent project line. It seems another script Focus on Next (or Previous) Project has the similar issue. Well caught – let me know if you spot any others. I’ve posted an update to the Keyboard Maestro macros, and the updated source text is below. // following or preceding project ? Thanks! 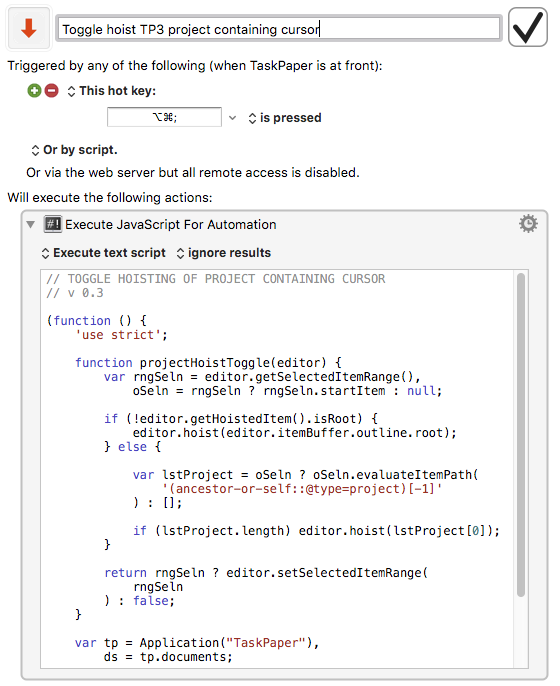 It’s so great, one of must-have scripts for taskpaper.